More big news, it looks like we have a house (or the mortgage company does)! We were quite despondent after losing that one in St Paul last week, but Emma called me on Monday about this place in a great part of town, very central, we saw it that night, wrote an offer, got it inspected yesterday and there we go. It’s kind of scary – first house and all that – and also a big place: three stories and basement, four bedrooms, two bathrooms, living room and dining room. But I think it’s a good price, although it’s old (1909) it’s in very good shape and hopefully not just an evil money pit. We’re really thrilled and nervous. Hopefully moving towards the end of August! So Hotmail came back up, and of course 70% of the mail I had was spam. But at least I could see it! I can’t get into my Hotmail account today from work. Not sure if it’s just my machine or our network, because Emma’s got into hers. But using Instant Messenger I know I’ve got 9 messages and I hate not being able to see them! Aaagh! Last night Emma and I went to dinner at our friends Karl and Christopher’s house for a Bastille Day celebration. They, as usual, had excellent attention to detail – for example the French Flag (from Alamo Flags at the Mall of America!) outside their house, and a tablecloth with pictures of grapes matched the main course – Chicken Veronique (Chicken with tarragon, garlic and grapes) – which was outstanding. A very pleasant evening indeed. 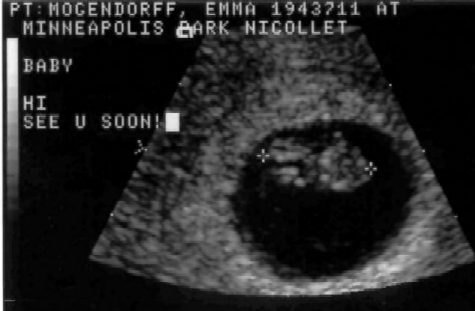 It’s probably time to announce that Emma and I are expecting a baby!! We’ve known for a while now – the scan above was taken on June 7, when the baby was just 14.6 mm long, so about 8 weeks old. I think the head is the blob on the right, and the body is the blob on the left. There was a flashing light between the two blobs which was the heart beating, an amazing thing to see even if it did make it look like an alien. We’re now in the 14th week (the baby will now be about 4 inches long and weigh around 4 ounces) and I think everyone is doing just fine. Apart from I’ve put on more weight than Emma. The due date is January 13! One of Emma’s friends yesterday suggested that we have a sweepstake to guess the birth weight of the baby (or the weight of me when the baby is born) which I think is a great idea. So click on the Comments link if you’d like to have a guess. We don’t know what the prize will be, if any, perhaps the honor of an evening’s babysitting. I got into work at my usual time of about 8:40 today, to find that a meeting had been set up from 8:15 until 9:00. So was faced with the quandary of whether to go in really late or miss it. I went for the former option and am wishing I hadn’t because I felt shunned for the remainder of the meeting (even though I probably wasn’t). I’m sure the day will pick up from here, but it really starts you off on the wrong foot. Today I’m glad that I’m not the President or Vice President. The day after Bush made a speech calling for greater accountability in corporate life, to help avoid more Enron/Worldcom-type scandals, the markets dropped like a stone. Perhaps the fact that he said more of these scandals were waiting to happen – not the most reassuring of things to say – is something to do with it? One thing I can’t get my head around is why he isn’t blaming more of this on the Clinton administration, when I’m guessing a lot of this malfeasance started. Maybe because it’ll be even more obvious what he was doing before he was president? But surely that would be a good get-out – “Clinton let this happen, we’re rooting it out which is why you’re hearing about it now”. Then Vice President Cheney has been called on in a case to do with his former company, alleging fraudulent accounting practices. Not to mention his hilarious quotes about Andersen which are recorded for posterity – “I get good advice, if you will, from their people based upon how we’re doing business and how we’re operating over and above the just sort of normal by-the-book auditing arrangement”. All these things piling on so that we’re starting to forget the whole Energy Task Force scandal where the VP held private meetings with energy executives, to help “shape” the country’s energy future. Then back to el Presidente, there are his own previous dealings while on the board of an energy company, which were found to be of no consequence by the SEC, but surely raise eyebrows. Of course, as this piece in Slate points out, they will probably get away with everything. It’s easy for those in power to be pointing fingers at others, but once again the hypocricy is astounding. Aren’t we all glad that integrity is being restored to the White House? Pretty much every day I try to do the Washington Post Crossword online. It’s a good balance of difficulty and there are handy tools for if I get stuck. And they (whoever “they” are) say that doing crosswords are good for keeping the brain nimble. By the way, we unfortunately didn’t get that house. Kind of annoying but there we go. I’m sure there will be plenty of others to get, we’ll just have to keep poking around other people’s homes for a bit longer. House things – on Wednesday night Emma and I looked at a couple of houses over in St Paul. One was quite nice but we felt that the rooms were bizarre shapes – difficult to fit our furniture in, long and narrow. However the second one we had a really good feeling about (you can click here to see the listing with photos of inside and out). It’s not the biggest place we’ve seen, but it’s in a nice neighborhood and feels a good size and price for a first home. Yesterday we went back and checked out the area a bit more. One of our main criteria was to be able to walk to places, and this place has a couple off coffee shops and restaurants, a bar and a bakery within fairly easy walk. We also spoke with one of the neighbors who said that it’s a good location. Fat Bald Ugly Insecure Broke? Did you know you can learn to hypnotize women into bed? Come on, dude – you can’t tell me you don’t need a little extra edge when it comes to scoring. It’s FUN, and it will CHANGE YOUR LIFE! Here we have to admire the advertiser’s direct targeting of his (I assume it’s a he) audience. I guess he’s hoping for someone to have an epiphany: “You know, I am bald and ugly, and maybe that’s why I’m not getting any girls – I should give this a go”. You are currently browsing the andrew.mogendorff.com blog archives for July, 2002.